A bank robber who was dubbed the 'Bearded Bandit' was sentenced Thursday following his conviction for robbing several Northern California banks, including one in Elk Grove. Keith Michael Ellis, 30, of Stockton was sentenced to 45 months following the conviction for eight unarmed bank robberies. Ellis was also ordered to $28,000 in restitution. 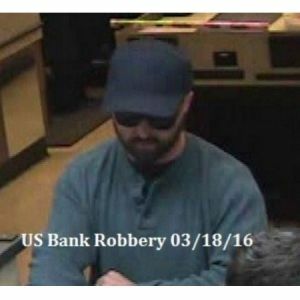 Among the banks robbed by Ellis during his spree included the March 1, 2016, robbery of the Chase Bank on Elk Grove Boulevard in Elk Grove. Ellis agreed to pay $1,000 in restitution to Chase. Ellis was arrested on March 23, 2016, by the Brentwood Police Department after they received a call from a citizen who reported seeing someone who fit the description of the robbery suspect. The sentence was handed down by the Judge Yvonne Gonzalez Rogers, U.S. District Judge. Judge Gonzalez Rogers also sentenced the defendant to a three-year period of supervised release. Ellis, who has been in custody since his March 2016 arrest, will begin serving his sentence immediately.